Any attempt to restore Russia's membership will undermine the credibility of the organization. Twenty national delegations to the Parliamentary Assembly of the Council of Europe signed a declaration saying that any attempt to restore Russia's membership will undermine the authority of the assembly. Head of the Ukrainian delegation, MP Volodymyr Aryev wrote on Facebook on 15 December that the declaration titled "To protect the values and authority of the Council of Europe" expresses over the attempts of certain forces in the Council of Europe to undermine the authority of the Assembly in particular and the Council of Europe in general. 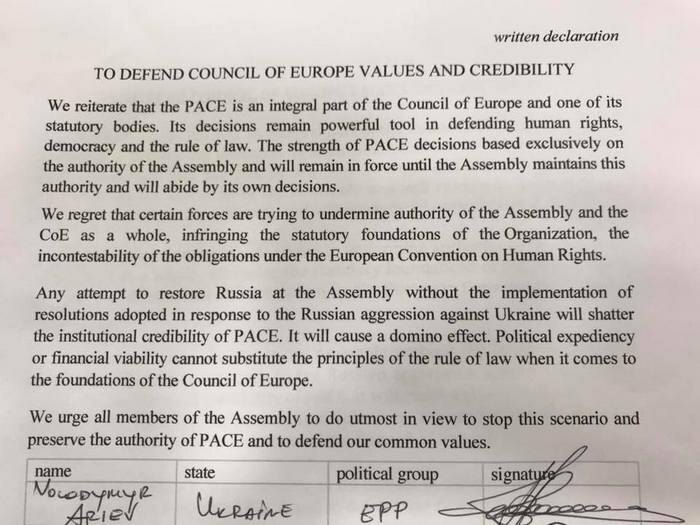 "The signatories also say that an attempt to unconditionally restore the Russian Federation's delegation in rights completely destroys the authority of PACE and will cause a domino effect in the organization and call to prevent this scenario," Aryev wrote. Among the signatories of the declaration are Great Britain, Germany, Georgia, Denmark, Ireland, Spain, Latvia, Lithuania, Luxembourg, Malta, Moldova, Netherlands, Poland, Portugal, Romania, Slovakia, Slovenia, Ukraine, Sweden, Estonia. 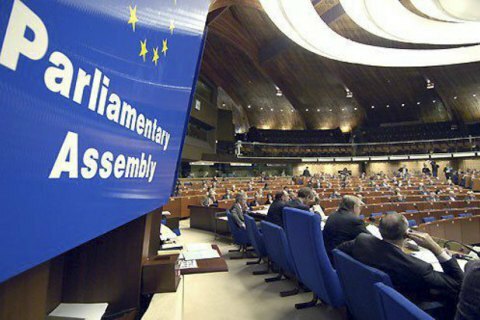 In 2014, PACE passed a resolution that deprived the delegation of the Russian Federation of the right to vote in the assembly because of the annexation of Crimea. Russian delegation was excluded from all governing bodies of the PACE. In the summer of 2017, Russia announced suspending the payment of membership fees in the Council of Europe. In response, the Assembly adopted a resolution aimed at lifting political sanctions from the Russian Federation. Diplomatic circles say that Ukraine is ready to suspend membership in the PACE if Russia is returns to the Assembly.